Question: Some people say they can’t understand your writing, even when they’ve read it two or three times. What approach would you suggest for them? Faulkner: Read it four times. 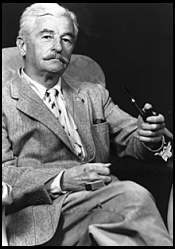 William Faulkner’s flamboyant use of language is a widely-discussed topic which includes a variety of subjects, including his use of part of speech, punctuation, long sentences, stream of consciousness, redundancy, visual imagery, metaphors, dialect, word clusters, coinages, paradox and poetics (particularly meter). No other contemporary American novelist of comparable stature has been as frequently or severely criticized for his style as William Faulkner. Yet he is a brilliantly original and versatile stylist. The condemnations of his way of writing have been in part just; all but the most idolatrous of Faulkner’s admirers must have wished he had blotted a thousand infelicities (142). Nominalism is reductionist first of all because it ignores the complexity of reality, the evasiveness of truth. It is grounded in the assumption that truth objectively knowable, that perception is entirely accurate (16). Faulkner took the opposite approach. Because words are so inadequate to capture reality, Faulkner piles words upon words in order to depict a variety of images and ideas which might at least add up to a fragmented picture of reality. I thought that he found out early what he could do and he stayed inside of that. He never did try to get outside the boundary of what he really could do and risk failure. He did what he could do marvelously well, first rate, but to me that is not success but failure….failure to me is the best to try something you can’t do, because it’s too much (to hope for) but still try and fail, then try it again. That to me is success (Meriwether 88). 1. Questions the exactness of a word. 2. Comments openly about the rightness of a word. 3. Searches for a word only to come back to original. 4. Seeks openly for a word. 5. Records progress, step by step. 6. Corrects word on the spot. 7. Acquiesces in inexact word. 8. Sets down and repeats in. Faulkner also uses the redundancy of adjective clusters to create a kind of depth in his depiction of reality. Hunter has painstakingly discovered 1416 examples of three-, four-, five-, six-, seven-, eight-, nine-, ten-, and even a thirteen-adjective clusters. (See chart). Faulkner also utilizes redundancy through a process which Hunter calls “Repeated Cluster Patterns” (139-40). We see a good indication of Faulkner’s playfulness in his uncommon use of parts of speech. One example of this is what Hunter calls Adjective Clusters. Maybe William Faulkner was greatest American novelist of the twentieth century; maybe he was an unreadable buffoon. What cannot be argued is that he continues to exert a tremendous influence upon the conventions of modern fiction. Ed. Frederick J. Hoffman and Olga W. Vickery. Lansing: Michigan State UP, 1960. Faulkner, William. The Sound and the Fury New York: Random House, 1990. William Faulkner, 1926-1962. New York: Random House, 1962. Faulkner: Three Decades of Criticism Ed. Frederick J. Hoffman and Olga W.
Vickery. Lansing: Michigan State UP, 1960. This entry was posted on February 11, 2012 at 9:18 am and is filed under Language, Morsel. You can follow any responses to this entry through the RSS 2.0 feed. Responses are currently closed, but you can trackback from your own site.